I know I’m not spelling this right, but I’ll correct it later. Dad lived on a farm for sixteen years and the name translates roughly as flowing water or moving water, it was Strautini (not spelled right). He left the farm when he was 16 to go fight in World War II for the German army. The farm was sold in 1971, and somewhere along the way the house and barn burned down, so there isn’t much left, but he wanted to see it, so we went. 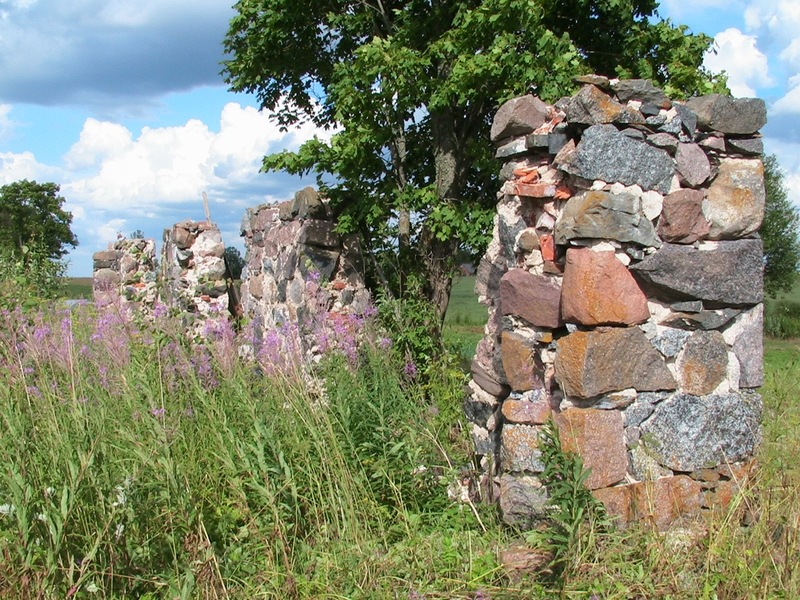 I saw the farm in 2005, and you can compare the photos to see how much it has become overgrown in just eleven years. Vitauts was very moved and saddened to see how the home that must have meant so much in his memories has now been reduced to rubble. After the trip, he just kept pointing out how it was his home, and now it’s gone. It was a moving moment for all of us. 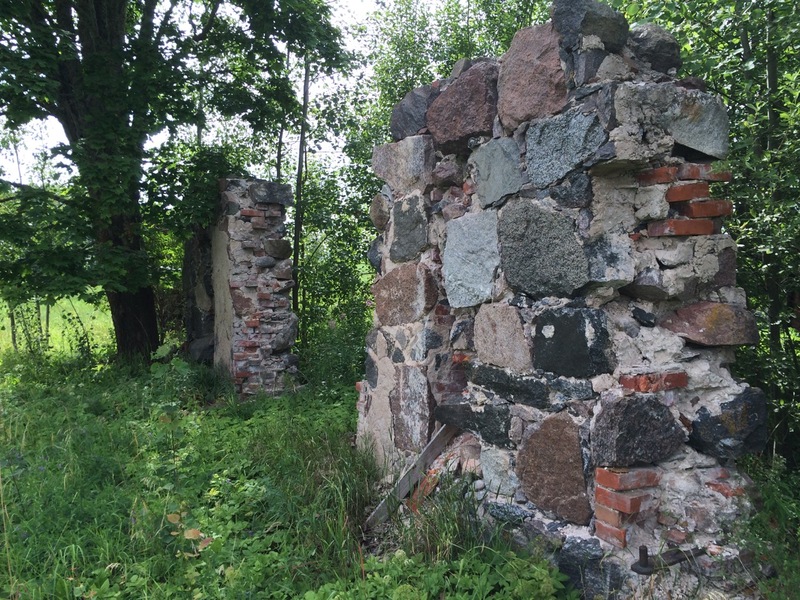 The footings of the old barn still stand as a testament to how Latvians build things to last, and the many farmhouses nearby that have been updated and are still lived in also demonstrate this ideal. I just wish Vitauts had more of his home to look at. We found out later that the schoolhouse he had attended also burned down. 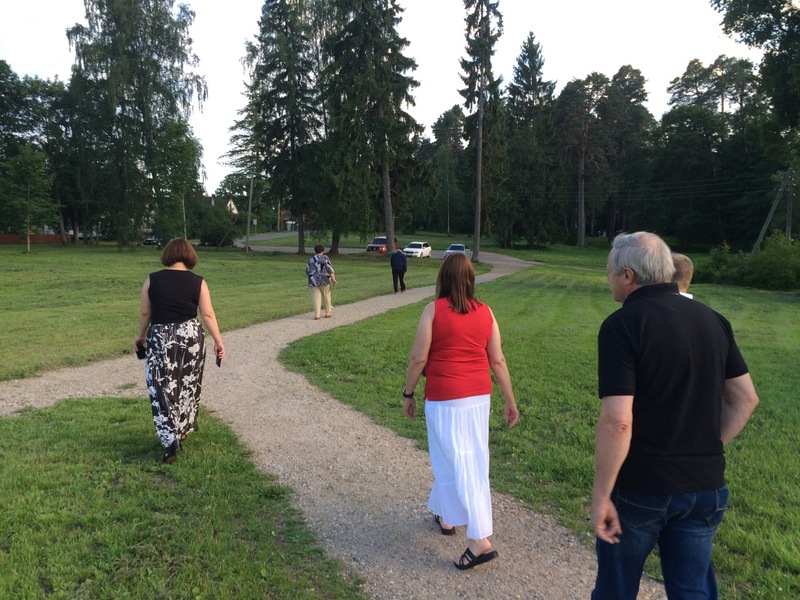 After a short visit at the farm, we drove into Smiltene to see the cemetery. 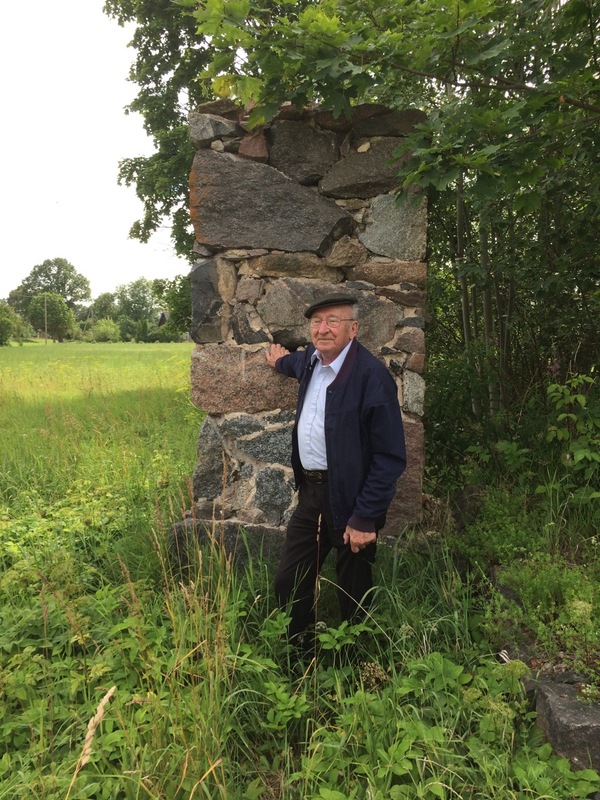 If you thought that him seeing his old homestead was a powerful moment, then you can imagine what it was like for him to see the graves of his “mamas un pops.” He also remembered his sister Maija who died when she was just a baby. 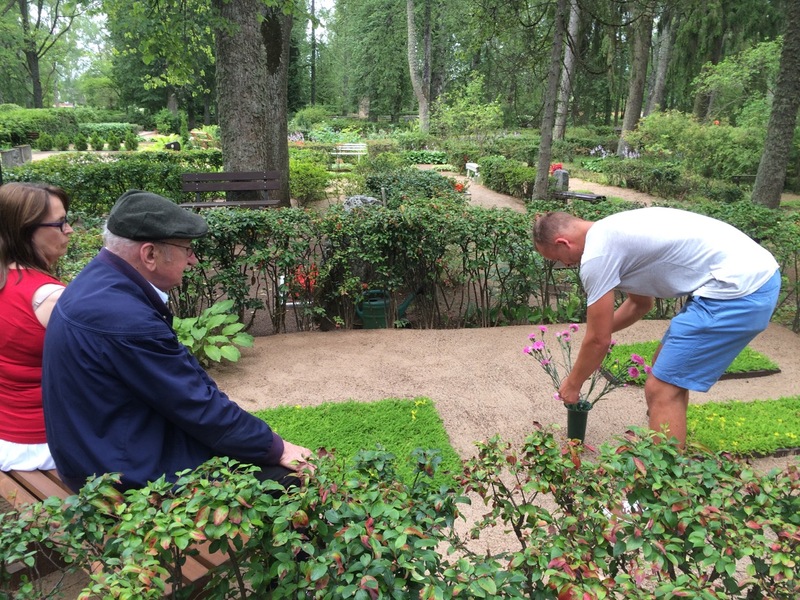 I already pointed out how beautiful Latvian cemeteries are, but this one was even more special because community members were getting ready for the big cemetery service which was coming up the next weekend. In Lincoln, they do a service in September at Wyuka for all the people buried there. 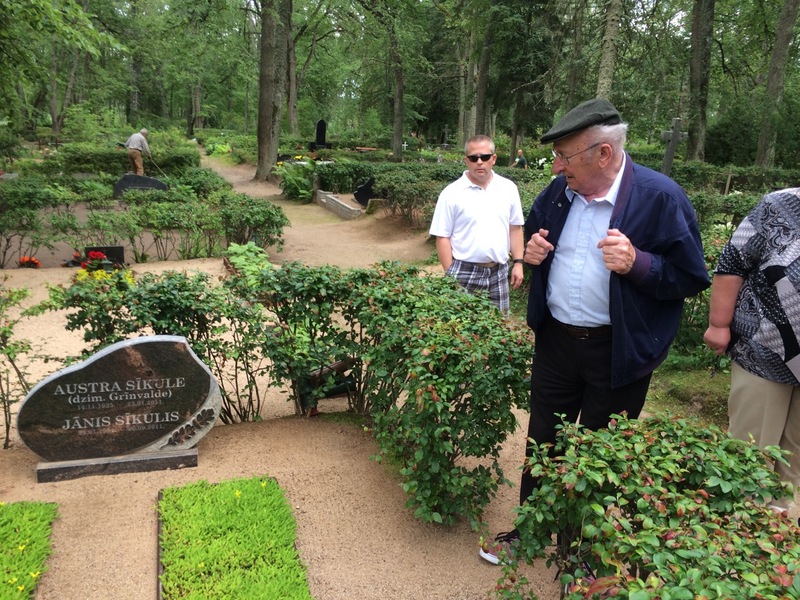 In Latvia they do the same thing rotating dates at various cemeteries throughout the summer months. So people were there with rakes, flowers and wheelbarrows of sand. They rake the graves to cover weeds and make them very beautiful. Each grave has a concrete planter which holds flowers or various plants and grasses. Dad insisted that he have flowers to put on the grave, so we sent Juris to go get some purple flowers. We found that Vitauts’ sister and her husband have markers, but our grandparents do not. 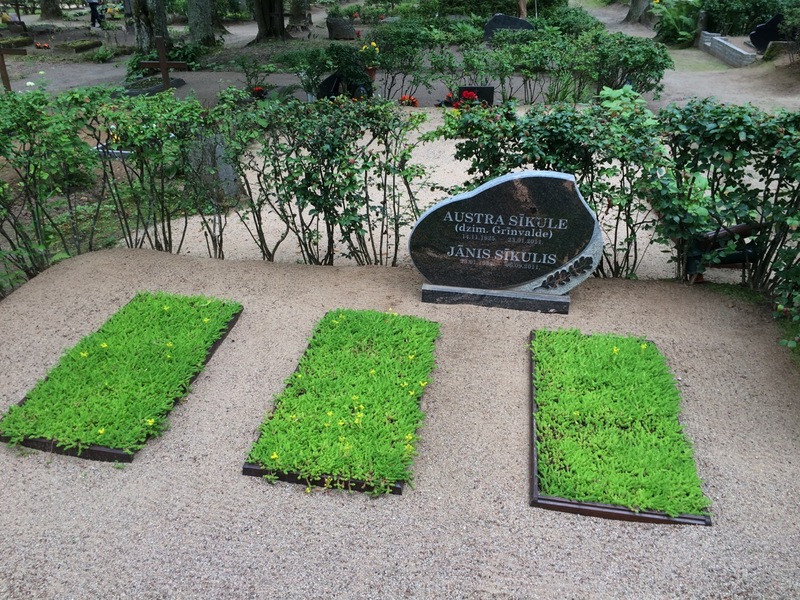 We also found Janis, his brother’s, grave. He died when he was 35 and he had been married. He was buried in a plot next to his wife’s mother. We didn’t understand that, but who knows why things happen the way they do. 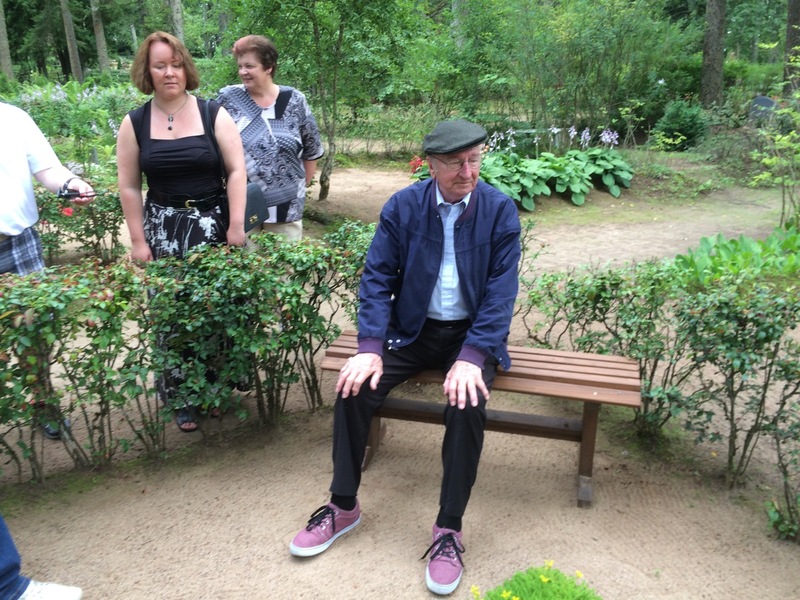 The coolest thing was that once dad set foot in Smiltene, he had a new spring to his step. He was almost running from grave to grave. It’s as if being home had given him several years back. We were walking fast just to keep up with him. After we finished paying our respects to our ancestors, we went to a cafe for lunch. We had a wonderful dinner together, and then went to see Helma. Helma, again, was dad’s childhood playmate, and she and dad have had a correspondence for many years. I think he must have had a crush on her way back when, but none of that matters anymore. When we arrived at her house, dad immediately pointed out the window he used to look out of when he stayed at the house. Helma and her daughter Dace (Dotsie) were waiting for us, and Helma shook hands with Gita and Janis but was asking, “Where is Vitauts? Where is Vitauts?” He was getting the flowers and wine, and when they finally met, it was magical. Sue and I both had tears in our eyes as we watched them hug. 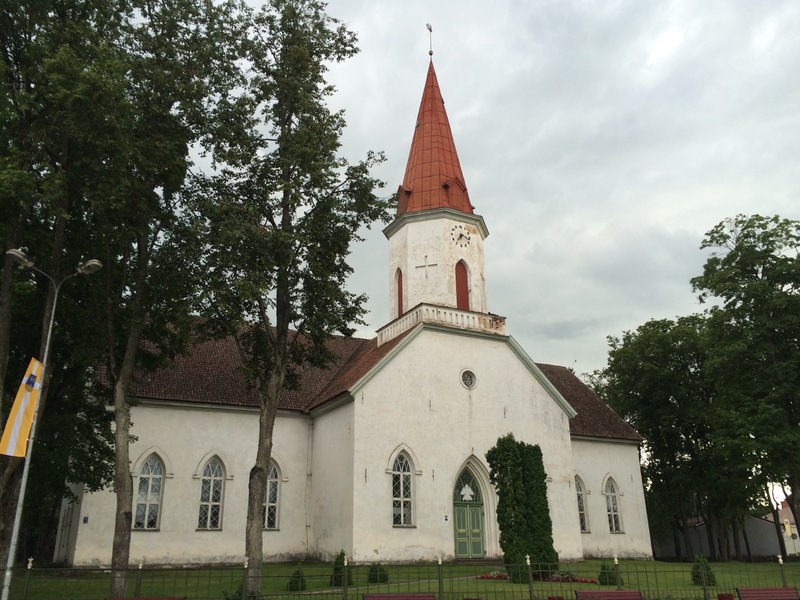 After the greetings, we went inside of this Latvian artifact. The house could use some updating, but it’s got a charm and beauty to it with antique decor. Again, Helma had gone out of her way to create a gorgeous table spread with coffee and baked goods for everyone. At eighty-nine she was as charming and wonderful a woman as I’ve met. She kept chastising me for not knowing my Latvian… one more reason to get learning. She had a photo album of pictures that Vitauts had sent over the years. It was so weird to see photos of your family in a Latvian photo album. Dad was flabbergasted and just in awe when he saw himself just out of seminary school. 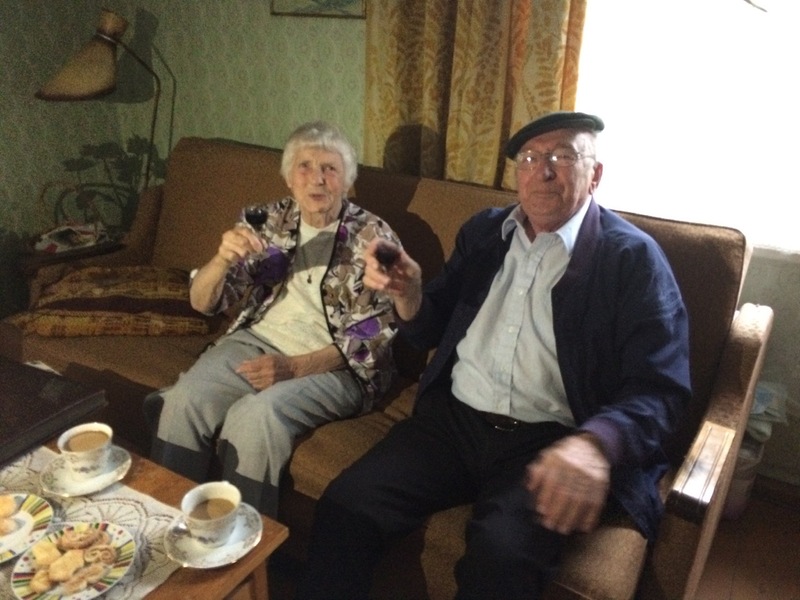 We knew they would want to talk for awhile, so after a toast with wine and adorable little glasses, Susan, Glen, Gita, Juris and I went for a walk to the town centr to see the old church established in 1209 and some of the other local sites. 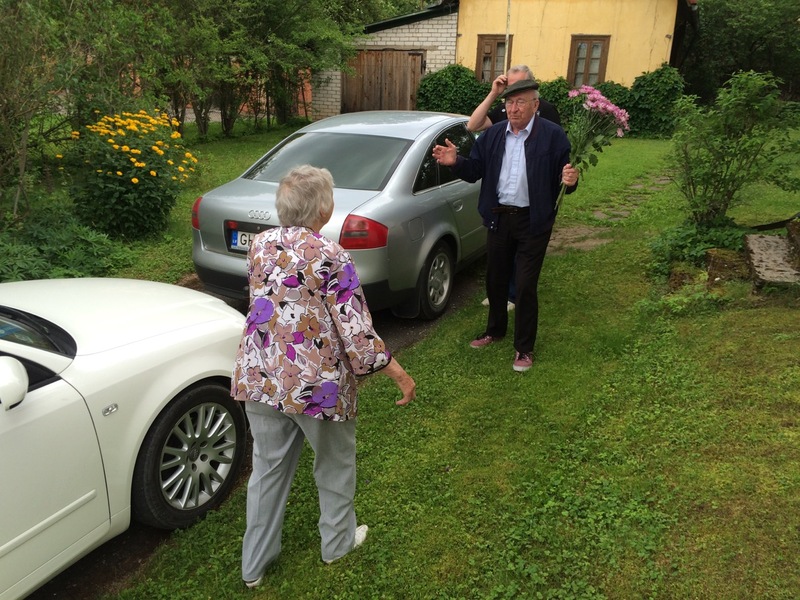 When we returned, Vitauts and Helma were still chatting away, but it was getting late, and we still had a two hour drive back to Riga, so we all said goodbye. Gita taught me how to say, “It was nice to have met you,” in Latvian and I struggled with it and it has already left my head. I remember “jaukum” which is “nice or pleasant.” The hardest part about the language is that words change endings for all kinds of reasons, and even if I think I know how to say it, it is hard. Very hard. I thought we were going to go home, but Janis wanted to make one more stop. He wanted to drive Vitauts past his old school and to the lake. When dad got there, I thought he’d be wiped out, but he scampered around the lake like he was ten years old talking about how he would walk this way to school every day when he was young. He walked the whole path pointing out landmarks that he could recognize and talking about how so much had changed. Then, we all walked back to our cars. The Latvians gave us gifts and we exchanged hugs and they drove off one way, and we went the other, into the sunset toward Riga. Thankfully, Glen offered to drive home which gave me a chance to enjoy a beer and navigate. We saw a double rainbow on the A2 while listening to Prince. The story ends after we dropped Gita off and struggled to find our way home. Latvians do not like street signs, and our map wasn’t very good either. GPS? Nothing worked for us. But we made it. However, our parking spot was blocked by an orange metal device, and when I tried to push it down, the guard came rushing over. I thought I was done for, but I called Bruno and gave the phone to the guard, and it was quickly settled. Thank God for Bruno Grasmanis! Enjoy some more photos: You’ll see that on dad’s land, there was a greenhouse and some tools and other objects. We think that someone is squatting or using the land, but no one seems to know who actually owns it.